Five days after the big snowstorm, and memory finally returns of the comic "Snowbound Language" piece posted two years ago, in which the language becomes as snowbound as the landscape. In the story, Snaddy, his snife, snaughter and snarking snog deal as best they can with the deluge of snow that has laid siege to their snouse. A lexicon for snowbound language can be found in a post called Principitation, which provides names for all the sorts of precipitation that is made special by having fallen on Princeton. There's snuff, snirt, snapples, snazzycakes and snight (snow that falls at night), snizzle and snool. The inspiration was a mix of the extraordinary variety of snow we got in early 2014, which made clear how the Eskimos could develop so many different words for snow, and Victor Borge's classic Inflationary Language, which allows language to inflate along with the economy. Create becomes "crenine", wonderful becomes "twoderful", and sofifth. The storm this past weekend brought a whole lot of one kind of snow, rather than the crazy variety of formulations that fell two winters ago. and availed itself of the comfort of our lawn furniture. A little sculpting and we'd have a pair of very content snowmen. Though there are cross-over recreationists who love both skating and skiing, you know you're in the skating camp if an approaching snowstorm brings wistful thoughts of all that gorgeous Carnegie Lake ice about to get covered up. It wasn't thick enough to skate on, but most of the lake was covered with a glistening smooth initial layer. The winter's brief history, about to be buried under two feet of snow, could be read in the rough ice that got blown into a southeast corner, on the left in the photo. and of water's restless shifting from solid to liquid and back again, that gathered these chunks together for one in winter's long progression of still-lifes. Our backyard minipond caught some runoff to make a miniature version of Carnegie Lake, with similar patterns of dark and light ice. Nice to have H2O as the artist-in-residence in the backyard, with a new snow exhibit about to open, up and down the east coast. but it's really a vine. to be used by the vine. Work with nature, or it can work against us. That's a truth whether the nature is inner or outer. This backyard minipond swelled in recent rains, then froze to make attractive patterns. A different scenario plays out on Linden Lane, where a sump pump discharges into the street, creating a hazard. Meanwhile, the high school's sump pump, a few blocks away, plays the role of ecological hero, discharging serendipitously and safely into a detention basin we converted into a wetland that sustains native plants, frogs, and crayfish. A shrub like buttonbush can grow right in the water of a backyard minipond. The ice patterns arise from the slow seepage of pond water into the underlying clay, causing the ice to sag. There's a tendency to want to get rid of sump pump water and runoff as quickly as possible, often adding to downstream flooding. More fun, and beauty, comes from a collaborative approach with nature, finding ways to use the water in the landscape. My sister-in-law, Edna, must have been reading my mind, which was puzzling over possible additional uses for a leaf corral. After being filled in the fall with leaves, a corral needs to sit through to the following autumn before harvesting the rich compost generated within. Snow, rain and decomposition cause the leaves to settle considerably. Might the corral do something more than just sit there through the summer, looking half filled? 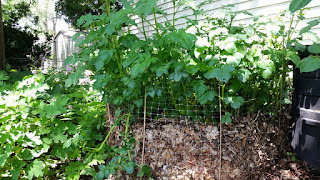 Edna answered that unspoken question by sending me a photo of her leaf corral in mid-summer, resplendent with the growth of potatoes. She took some store-bought potatoes that had started to sprout, buried them a few inches down in the pile of leaves, and let the potatoes do the rest. Because the potatoes weren't grown in the standard way in soil, they were much easier to clean. She mentioned having prepped the leaf corral by watering some Milorganite into the leaves, to add nutrients and speed decomposition. A product produced near her suburb of Milwaukee, Milorganite is described on its website as "composed of heat-dried microbes that have digested the organic matter in wastewater." That's a 90 year success story in and of itself, but I'm thinking of skipping the Milorganite in favor of a few shovelfuls of rich dirt or compost sprinkled on top over the winter. With decomposers migrating up from the soil, and nutrients infiltrating down from above, there should be plenty for potato roots to feed on, sustained through droughts by that moist, spongy realm inside a leaf corral. 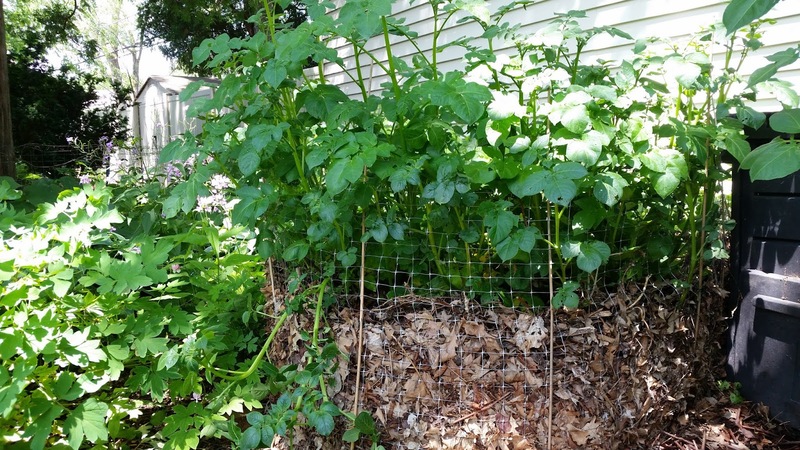 Riffing on the "Wishing (the earth) Well" name for one of our leaf corrals, the potato-bearing corral can be called the "Living Well", which feeds nutrients back into the earth while growing food out of the top. At least in one yard, Princeton had a white Christmas, with snow-covered evergreen and a few inflatable penguins playing hide and seek. Elsewhere, the 65 degree weather turned a lot of flower buds into suckers--a botanical morphological miracle of sorts. For these cherry-like trees planted along Walnut St., 2016 will be a growing year, with no blooms in spring. These blossoms fit, at least colorwise, with the wreath on the door in the background. Winter jasmine (Jasminium nudiflorum) took the warm weather bait. Though considered a vine, it could easily be mistaken for a forsythia shrub in a neighbor's yard on Stanley Ave.
and a stray aster over at Westminster's parking lot. Not shown is the asian witch hazels, which also started blooming. Native plant species--all or nearly all--remained dormant. A flock of robins, drawn north by the warm weather, made a surprise Christmas day visit, in search of any insects beneath the leaves. On a day made all the more peaceful by a lack of traffic noise, the warm weather drew us out as well, for an evocative, misty walk along the canal. These oak leaf hydrangia leaves were doing their part to express holiday cheer. Our thermometer was expressing more the spirit of El Nino. Posted this at VeblenHouse.org, but forgot to post it here. Tomorrow, Sunday, Jan. 3, come by Veblen House in Herrontown Woods, where our Friends of Herrontown Woods group is hosting a gathering to show off the recent transformation of the Veblen House landscape. Should be a beautiful day, but cool, so dress warmly, and we'll have something warm to drink. In addition to touring the grounds, you can participate in a planting of pawpaws to symbolize new beginnings, not to mention future harvests of delicious tropical-tasting fruits. We'll be there 2-4pm.